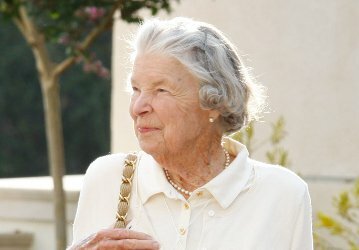 A loyal and longtime friend of Thomas Aquinas College, Frances Scheller Morehart passed away on November 13, just one week short of her 94th birthday. Mrs. Morehart was the step-daughter of the late Fritz B. Burns, whose eponymous foundation has provided the funds for several buildings on the College’s California campus, including, most recently, the St. Gladys classroom building and the St. Cecilia Lecture and Concert Hall. She was also a generous benefactor of the College in her own right as a 15-year member of the President’s Council. A regular participant in the College’s Summer Seminars, Mrs. Morehart had many friends among the College’s faculty and administrators, and was especially close with fellow nonagenarian and chaplain Rev. Cornelius Buckley, S.J. Mrs. Morehart was born in Los Angeles in 1924 to Gladys Carson Scheller and Edward McLaughlin Scheller. Her father died when she was four, and when she was fifteen, her mother married Mr. Burns, who became a cherished stepfather and wonderful role model. Around that time, she also met the love of her life, Jack Morehart, whom she married four years later. The couple lived for many years in the Pacific Palisades, raising nine children, before relocating to Carpinteria in 1974. Mrs. Morehart is predeceased by her husband, Jack, and son Mark. She is survived by her children: Martin (Patricia) Morehart, Missy (Glen) Mueller, Miny (Roger) Willmon, Michael (MariaLuisa) Morehart, Matt (Sally) Morehart, Marcia Morehart, John Manuel (Lisa) Morehart, and Mitch Morehart. She is also survived by 26 grandchildren and their spouses, 37 great-grandchildren, and numerous beloved friends. A Rosary will be held tonight at 7:00 p.m., and a funeral Mass will be offered Tuesday, November 20, at 10:00 a.m., both at Our Lady of Mt. Carmel Church in Montecito, California. May her soul, and those of all the faithful departed, rest in peace.